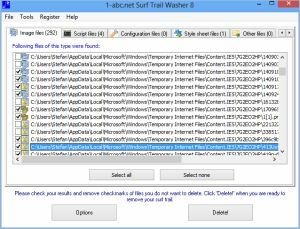 1-abc.net Surf Trail Washer - Delete your internet trail permanently! There are many ways and tools to delete the trail you leave on your computer when you visit websites – but this one already washes it away while you are surfing! The program runs nearly unrecognizable in the background. You can surf the web as always without any restrictions! Do you know that every visited website leaves files on your computer? Besides temporary internet files that include images, pdf files and every single word you could read Windows also saves the URL of each visited site in the internet history, some websites save so-called cookies to identify that you already were on that page next time and everything you typed into the address bar will also be saved for later use. All these features allow more comfortable surfing of course: for slower internet connections it could make sense to read files from your local machine when a website is visited twice, cookies can help you to login to shops and personal areas and the history supports you on your search which sites you visited last week. What many users forget: This can mean a big lack of security concerning your privacy! When more persons are using the same computer, everyone is able to see what the others were surfing for. Do you really want your family members, your boss or your friends to know what you do in the internet? Can you still sleep well when you borrow your notebook to a friend or give it away to the service for repair? 1-abc.net Surf Trail Washer lets you sleep perfect now. Every single internet data your system recognizes as saveable will be deleted immediately! Now it does not matter anymore who suddenly surprises you while you surf through the web. 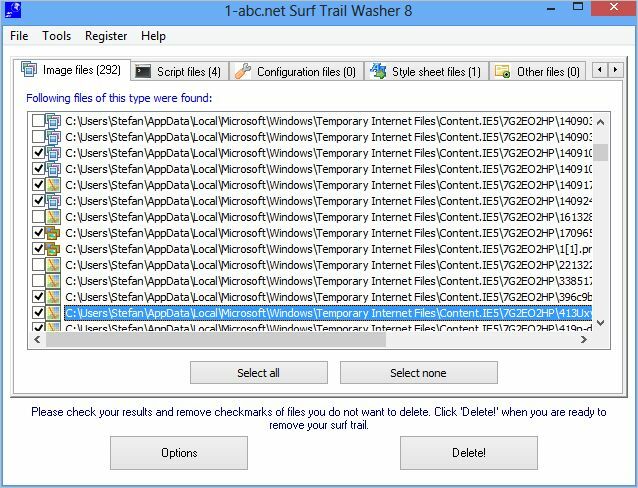 1-abc.net Surf Trail Washer lets your internet trail simply disappear as you would have not visited any websites at all! Very low system resources required – surfing with the same speed as before!